Within a short drive of Mazamet there are a number of places to see and things to do, this is not an exhaustive list, and over a welcome drink we chat to guests about what can be seen close by, or further afield. Mazamet’s neighbouring town, just 15 mins (by car, bus or Train), is well worth a visit. The river Agout runs through the middle of the town and provides a great focal point with medieval houses stretching into the water. A boat trip, weekly markets, a visit to the “Musee de Goya” (a Spanish art museum on account of Goya’s presence in the town towards the end of his life) and a stunning topiary garden are just some of the attractions. Another of Castres attractions is the municipal leisure park, L’ Archipel, with ice skating, indoor & outdoor swimming pools, golf and waterpark – a day-out in its own right. 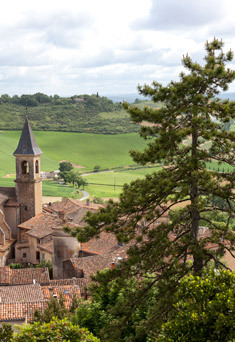 An unspoilt medieval hilltop village located just 30 mins from Mazamet can be seen on route to Albi or nearby Gaillac (or combined with a trip to Castres). Lautrec is a nice place to enjoy lunch and a visit to the windmill (which still works today to mill flour on special occasions), with its stunning panorama towards the Pyrenees. The office of tourism which houses an original communal bread oven as well as a model of how the fortified village would have appeared in medieval times. A small market takes place each Friday morning where, amongst other local produce, the famous pink garlic grown in the fields around Lautrec will be in abundance. Montagne Noire (Black Moutains), with a peak of 1,200 metres, offers an amazing variety of flora & fauna. Dotted with medieval villages, lakes & deciduous forests (it is even home to the Cabardes wine AOC) the Montagne Noire can be reached within minutes of leaving La Villa. Why not drive to the “Pic du Nore” for the best vista in the area, over-looking the Carcassonne plains with the snow-capped Pyrenees beyond? For a relaxing scenic drive or cycle (or using the Tarn Bus), enjoy the Valle du Thoré which leads from Mazamet to the town of St. Pons de Thomieres. With wide open pastures of crazing cattle and a number of pretty mountain villages, you can enjoy a visit to textile museum in Labastide, take a journey underground in the caves “Grotte de la Deveze” with its amazing formations and end with a visit to La Cathédrale de St Pons, which was once one of the most important churches between Montpellier & Toulouse. From the air, the village of Labruguiere is a complete “rotund” and once an important post for traders passing between Albi & Carcassonne who had to pay a fee to cross the river Agout. There are a number of well preserved buildings in the village centre and on Friday mornings a market that takes places on a number of the narrow streets. Labruguiere can be reached by train from Mazamet or 15 mins by car and you can enjoy a lunch in one of the town’s restaurants before either heading onto Castres or returning back to Mazamet. 20 mins north of Mazamet is France’s second largest granite reserve. The area of “Sidobre” sites within the Monts de Lacaune mountain range. Amongst the forests and plateaux you can discover some amazing natural rock formations carved during the last ice-age like the “Chaos” or “Napoleon’s Hat”. Of course there are many other places to explore using La Villa as a base – just let us know if you have a particular interest, be this wine, walking, cycling or history and we will give you some suggestions! For those who will not have a car during their stay at La Villa, we can let you know about places that can be reached by public transport. The great value “Tarn Bus”, train and pedal power can take you to a number of local towns & villages; we also have an arrangement with a local driver for private day trips or transfers too.